Ravinia Brings Out Everyone's Best. Latonia Moore (Aida) Roberto Alagna (Radames) Michelle deYoung (Amneris) Morris Robinson (Ramfils), James Craswell, The King of Egypt, Mark Delevan (Amonasro), Joshua Guerro (The Messenger), Sara Murphy (Voice of the High Priestess). Verdi’s own brand of passionate, dramatic exposition erupted full force under the Ravinia stars. Lavish and luxuriant melodies were wonderfully declaimed. Like La Boheme, the only opera warhorse that tops Aida on list of all time favorites, regulars sometimes wonder why they are hearing this work yet again. Of course, we know it will give pleasure to novitiates and maybe keep the form alive. But then we listen, and are struck again by the masterful composition of this late Verdi opera. Any less than a full embrace would seem inappropriate. James Conlon is the great conductor in the US today. He shares his enthusiasm for the opera form and the human voice with wry good humor and wit masking his deep knowledge. It is fun to hear the Maestro discuss music. It is even more fun to hear him conduct. His approach always puts the music front and center. From the opening notes of the Aida’s Prelude to the suffocation of Aida and Radames in an airless tomb, Conlon brings forth the glories of the music. The strings of the orchestra are particularly sweet in Aida’s motifs. The horns blast away to fill your mind with visions of triumphant warriors and pyramids and chariots of fire. Some of opera’s recent big moments were on display at Ravinia. Roberto Alagna, who made his Ravinia debut in this concert production, recently added the role of Radames to his repertoire. It has taken this fabulous tenor a while to settle into the role, but at Ravinia, he was as brave as the warrior and as torn as a man in love with the wrong woman can be. His voice matched those of his various partners well, particularly Michelle de Young and Latonia Moore. Singers who carefully craft their careers work in venues where they are supported and with conductors who treasure the human voice and provide a cushion for artists doing what may be the most challenging task in the world: Standing in front of a full house and singing. Watching James Conlon pick and nurture talent shows that is possible to deliver wonderful productions mixing tried and true with up and coming talent. 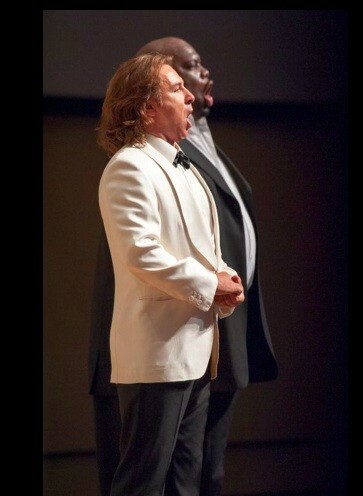 Standing next to Alagna on stage at Ravinia, Morris Robinson, a graduate of the Metropolitan Opera’s Lindeman Program, was superb. Conlon has championed this young, huge-chested singer with a perfect, and absolutely unique sound. Robinson, an All-American football player, has had some trouble becoming an actor, but his voice is so wonderful, raising Stanislavski from the grave should be attempted if it would help. Maybe however, we don’t need to try this. On stage at Ravinia, as the evil priest Ramfils, Robinson richly colored and dramatized his role. He clearly feels comfortable in the hands of this Maestro. Michelle DeYoung has all the vocal goods, but is also challenged. Again she warmed to one of her finest performances as Amneris. Mark Delevan showed why he is a first choice for roles like Wotan as he depicted the defeated warrior Amonasro in words and music. James Craswell was a superb King of Egypt. In smaller roles, Joshua Guerro made you appreciate the messenger, if not the message. Sara Murphy, who sang an incredibly moving Britten Phaedre a week before, is rightfully being put center stage by Maestro Conlon. 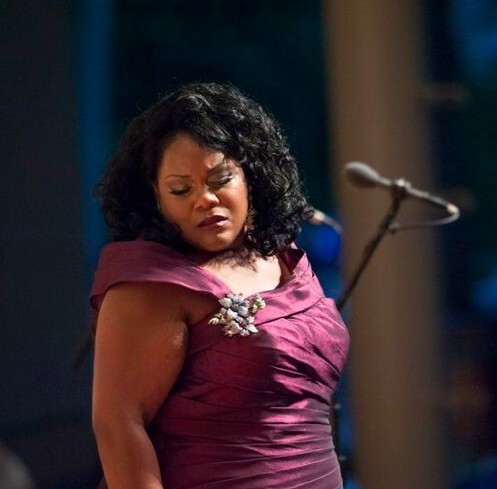 Latonia Moore made her mark stepping in for Violetta Urmana at the Met earlier this year. 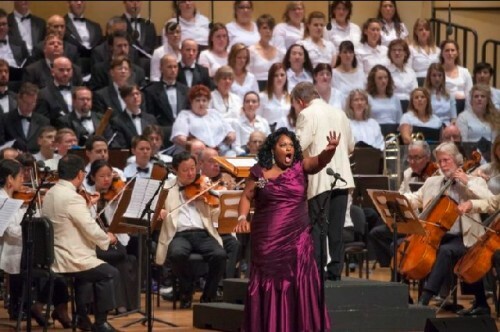 She had a rapturous reception and her performance at Ravinia made clear why opera fans adore her. She has the package. A lovely woman with an even more lovely voice, she captivates in her upper register with impeccable phrasing and an easy reach to the high notes. An emotional actress, you feel Aida’s joy and pain in her hand gestures and in her voice. She has performed Aida at Covent Garden, and in Dallas, as well as Hamburg. A student of Bill Schuman’s, she may well have gone on stage at the Met by his special arrangement. Stephen Costello did. So did Meade. Schuman has a star-studded list of students. With Moore, one only hopes that taking some wise words from Conlon, she takes her time. There is no reason why she should not have a huge career. Attending a Conlon master class at Juilliard it was clear, and always is as the Maestro presents music, that the music is first and foremost. Conducting at Ravinia, Conlon celebrated Eastern flavor, dreamy and charmingly colored. The triumphal march was magnificent, with trumpets blazing. What would happen is he succeeded in James Levine at the Metropolitan Opera? Peter Gelb could stay on taping his HDs. but from OPP (Other People’s Productions). Conlon is unlikely to make it to the Met. But the terms of future forecasting are being altered. Ronald Wilford and Columbia Artists Management have lost their ironclad grip on Boston. Their percent of James Levine’s Met salary may soon slip away. Gelb’s power comes in part from CAMI and if they have nothing to offer any longer, can getting the Met out of Gelb’s grip be far behind? Wishful thinking after a glorious evening in Chicago.